Last week I attended an event in the University of Surrey that was about providing high speed connectivity to un-served and under-served areas in future. While there is no arguing that satellites are a great option for unserved areas, the underserved areas can really benefit by such initiatives. 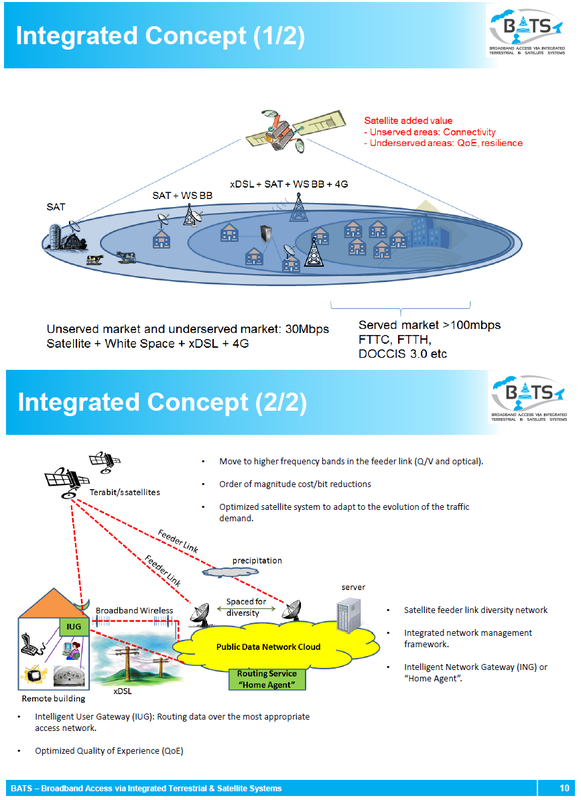 The way this is being proposed is to have a specialised Intelligent User Gateway (IUG) that can connect to ADSL, Mobile and Satellite. The assumption is that in areas of poor conectivity, ADSL can provide 2Mbps and the mobile could do something similar, upto 8Mbps. The satellites can easily do 20Mbps. While the satellite broadband has the advantage of high speeds, they often suffer from high latencies. ADSL on the other hand has very small latency but may not be good enough for streaming kind of applications. Mobile generally falls in between for latency and speed. 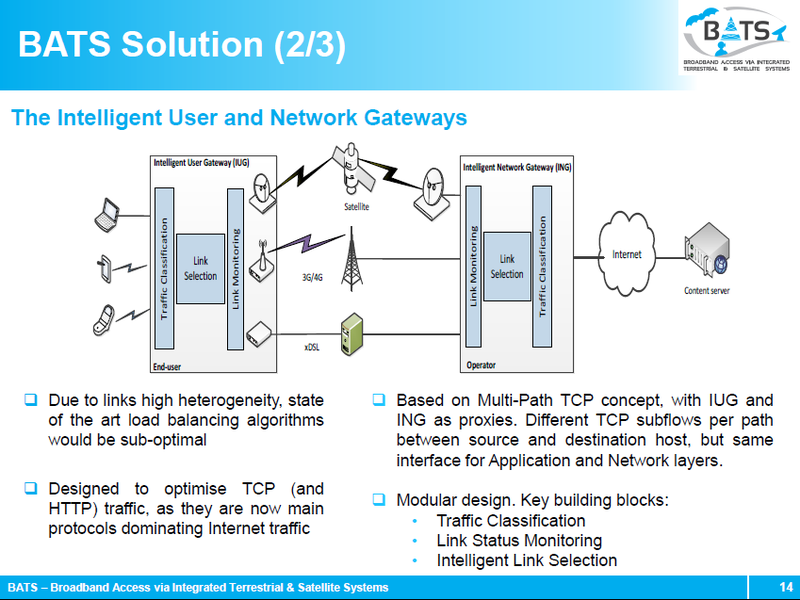 Using Multipath TCP and some intelligent routing algorithms, decisions can be taken to optimise for latency and speeds. I did see some impressive demo's in the lab and it did what is says on the tin. The real challenge would be the business models. While ADSL can offer unlimited internet, both Mobile and Satellite broadband will have caps. I was told that limits could be imposed so that once the Mobile/Satellite data allowance is over, only ADSL would be used. Maybe a more complex algorithm could be implemented in future that can include cost and priority of the application/service being used. An example would be that sometimes I want to watch some long videos over Youtube but I am happy to start buffering an hour in advance. Its not critical that I have to watch that now. I would be more than happy to save my Mobile/Satellite broadband data allowance for some other day when I need to watch things more urgently. If the end of month is coming and I have a lot of data allowance left then maybe I dont mind using the quota otherwise I will anyway lose the allowance. Its always challenging to put this intelligence in the routing decision algorithms though. For locations that have a separate terrestrial return path but want to use satellite to increase the download capacity I designed a concept for a satellite router receiver for under $50. I haven't met anyone who wanted it yet but it would be easy enough to implement. Shahnawaz, when you say outbound, do you mean download/downlink from the receiver point of view? BATS uses the download via satellites but the TCP acknowledgements go back via terrestrial link, because that has low latency and the Acks dont use much bandwidth. Shahnawaz! Create queries via a terrestrial channel, and receive responses via the satellite channel is a logical contradiction. If you have an unreliable terrestrial channel, the disconnection will. If there is a reliable high-speed terrestrial channel, then why use a satellite channel for the answers? The cost of a satellite channel resource is still higher than the terrestrial channel, even for promising HTS program BATS. All known systems that provide requests for terrestrial channels and answers via satellite, have not been developed. Perhaps today you can find some use with the development of LTA (LTE-A), there may be situations where the overload of cells. Still, it's not a promising regsheniem, I think. Oskar - Many Thanks for link. Will read on it! Zahid - This is precisely my point about Downloads/Outbound via Satellite and Uploads/Inbounds via terrestrial.. If BATS uses ack's via terr's - tht reduces a lot of headers on the frame reducing re-triggers and eventually capacity saved with less delay! And with good compression technique's - it should help! Valentin - I guess in-principal you are correct. However, having a good terr's can really help save ack times and packet loss over a satellite link going via same inbound channel! If the terr's is bad - Then both ways you have to go with satellite link anyhow! While we all agree that a high speed terrestrial link is far more preferable to a satellite link, use of hybrid systems like the one mentioned in artical are definitely better. The issue of asymmetric traffic routing consisting of outbound/inbound over satellite and other part over terrestrial is generally avoid using network rules in the egress and ingress points of the network. Also newer techniques of spoofing delay by use of accelrators are in vogue. Thus the issue of unequal latencies and mismatch would not arise. The scheme is a good alternative to boost user experience and improve reliability of service networks.